Since 2007 the probe has been traveling through the outermost layer of the heliosphere—the vast bubble around the Sun and the planets dominated by solar material and magnetic fields. Voyager scientists have been watching for the spacecraft to reach the outer boundary of the heliosphere, known as the heliopause. 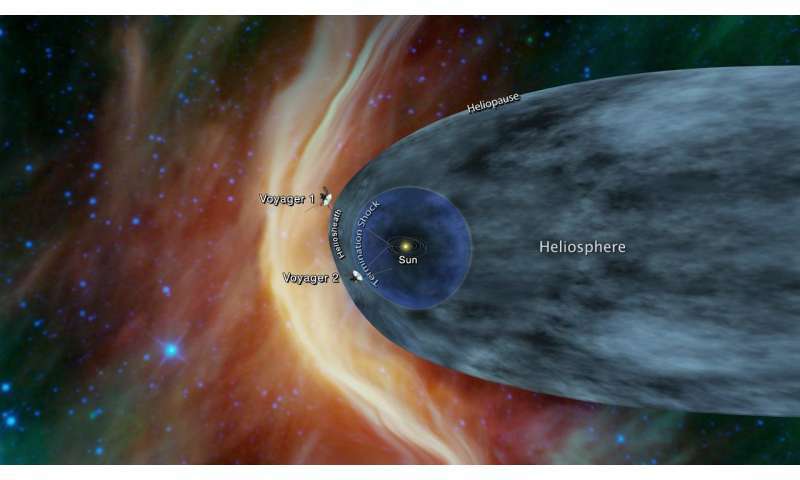 Once Voyager 2 exits the heliosphere, it will become the second human-made object, after Voyager 1, to enter interstellar space. However, Voyager team members note that the increase in cosmic rays is not a definitive sign that the probe is about to cross the heliopause. Voyager 2 is in a different location in the heliosheath—the outer region of the heliosphere—than Voyager 1 had been, and possible differences in these locations means Voyager 2 may experience a different exit timeline than Voyager 1. "We're seeing a change in the environment around Voyager 2, there's no doubt about that," said Voyager Project Scientist Ed Stone, based at Caltech in Pasadena. "We're going to learn a lot in the coming months, but we still don't know when we'll reach the heliopause. We're not there yet—that's one thing I can say with confidence." Voyager 1 crossed into interstellar space 121 AU from the Sun. Voyager 2 is currently 118.8 AU from the Sun and in three months time will be about 119.6 AU from the Sun. Interestingly, Voyager 2 has an active plasma science instrument, so it can directly detect the solar wind and we might learn a little more about crossing into interstellar space this time around. Voyager 1's is broken and that information had to be inferred. Voyager 1 was undoobatably damaged by a lightning bolt fired at it by from an Official EU electricgun when the probe passed too close to the secret theosophist base on Planet Mysterion! Shh, don't tell anybody.... It's suppose to be a secret. Part of the Uranus Conspiracy to suppress public knowledge of EU woowhooey. And you thought the illuminati were even in this game? Bah! They haven't been serious players on the World scene since Benjamin Franklin and Napoleon Bonaparte whipsawed them to avenge the Assassination of Mozart! I am glad that is official, saw someone meticulously following the published data on a site giving an opinion that 'maybe it is close' one or two weeks ago. @Mark: Thanks for the roundup! I had forgotten that we may get nicer data (if the instrument keeps being supplied with enough power a few more months). As a young lad, I loved the first Star Trek film - "Star Trek - the Motion Picture" and I watched old reruns of the TV show. And it turns out that the Voyager or Vger in the movie was Voyager 6. I'm wondering now if there will ever be another Voyager besides these two. Perhaps equipped with enough nuclear fuel to last a million years. Mark: Thanks! It will be good to get a second, fuller set of observations about the boundary of interstellar space. SEU: I like STTMP too. Our probes have to go much faster for V6 to reach the machine planet in reasonable time. (I'm not sure where Starman's civilization intercepted V2...) One of the ways we might communicate over interstellar distances with low power signals is to place relays at the solar focal points opposite the desired target. Our sun's focal point (actually an axis) begins at about 550 AU. Now consider that our voyagers are less than a quarter of the way the way to that distance despite having been outward bound since 1977. We're going to need some better tech to put observatories/relays at those focal points.